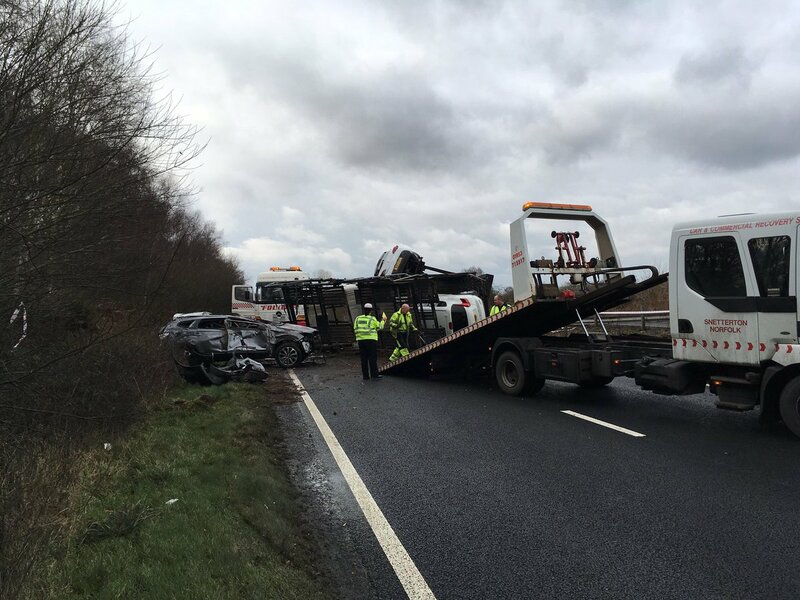 The A11 near Thetford in Norfolk is likely to remain closed well into this afternoon after a car transporter crashed spilling a number of cars on to the road. The A11 at Thetford in Norfolk is currently closed in both directions after a car transporter hit the central reservation between the A1075 and Larling crossroads. A number of cars as a result a number of cars came off the transporter and onto the road. Both carriageways of the A11 have been affected and the road is closed whilst emergency services clear the scene. The road is expected to be closed for some time, and motorists are being advised to avoid the area. Local diversions have been put in place. The East of England Ambulance Service is on the scene treating two casualties. None of the injuries are believed to be serious.